Zimbabwe Pensioner Supporters Fund drivers, March 2009 Zimbabwe trip Report. A huge Milestone was reached on this trip in that we took all three our vehicles across into Zimbabwe, heavily laden with full loads of food, clothing, a wheel chair and a wheeled walking aid. To this end we give our Lord and God all the Glory for what He has made possible for us to do through you, our faithful donors and supporters. 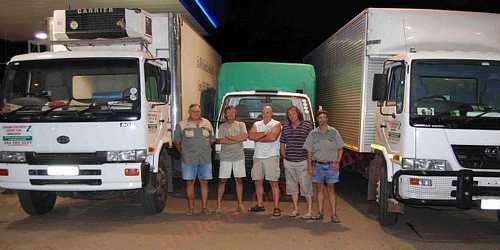 We had five competent and qualified drivers doing the run this time and as Daniel Koekemoer pointed out to us, we were a much more relaxed bunch knowing that there was always someone ready to take over when fatigue reared its balding head. We were Hannes Botha, Daniel Koekemoer and his brother Neels, KC Schuuring and myself. Daniel was on his third trip, his first as a driver, and Neels was on his first as was KC. Thank you guys!! We set sail from Malelane early afternoon on Thursday the 19th March 2009 as there was the inevitable delay with our documents at the border again, arriving at our pit stop in Musina with Henry and Elizabeth Cameron at their Bed and Breakfast just on midnight. As usual these great folk spoilt us with a good bed and wholesome meals. After sorting out the paper trail we eventually crossed the border at 21.45 on Friday 20th, said our good byes as we parted company with Hannes and KC who were going the long route around Masvingo, Mutare, Rusape, Marondera Harare, Mvurwe, Binbura, Chinhoyi, Chegutu, Kadoma, Kwe Kwe and Redcliff. En route he made new contacts with three homes in Mutare as well as some outsiders, a home in Rusape that’s in danger of being closed down and the home in Bindura where as in most cases the needs are overwhelming. In Rusape they found a man, Mr F.T Coffee of Resthaven Cottages who had medication sent to him from SA, by insured, registered post and all he received was an opened, unsealed empty parcel. The man is in desperate need of these medicines and yet someone has the audacity to remove it. This is not an isolated instance, it happens all the time he says. Another man, was sharing with Hannes and 'KC' with tears in his eyes, that he had lost every thing, he has nothing now and at times he doesn’t know where his next meal would come from. He was shot, lost his wife, his farm, his petrol stations and all he has to live for is himself. He was given a box of food and the look of gratitude and awe on his face makes all that we are doing worthwhile. The situation in Chegutu was also far worse than we anticipated with many of the people not catered for sufficiently. Hannes and KC drove the 10ton UD 90 and trailer as they could carry more while the Koekemoer brothers and I used the old 4ton Dyna and the 8 ton UD 80. A special thank you to Mike and Marion Futter and family in Harare and the hosts of Hannes and 'KC' in Mutare for their hospitality and we as a Fund want to thank you for giving of yourselves in so many ways to be part of helping these special folk in Zimbabwe, and helping us as well. God Bless you. My route with Daniel and Neels, involved Esigodini, the eight homes and many outsiders of Bulawayo, Boggies and Huisvergesig in Gweru, MUUS in Sherugwe and Zvishavane. All crews and trucks were back safely across the border by the 26th which was good timing. A warm and sincere thank you to Craig and Lesley Hunt of the 'Southern Comfort Lodge' in Bulawayo for looking after the team, so that we were refreshed to carry on further with our trip. Also a sincere thank you to Attie & Anna Scheepers of Gweru who always has a open door for us where we can relax and be spoilt, always feel refreshed when we leave there to finish the rest of our trip. All told, this was our biggest input and we thank you, our supporting public, for all you are doing to make this enormous task possible, be it materially, financially, prayer cover or just a good word of encouragement. For those many we do not thank on a regular basis, you know who you are.. Thank you, thank you and once again thank you. For all of our representatives in every area, their helpers and the guys running our 'pick up' and 'drop off' points, thank you, we will never be able to carry on without you all...YOU'RE ALL VERY SPECIAL!! Somebody asked me recently, how long do we expect to be doing this task? It is not difficult to see this operation going on for many more years ahead. Even though the situation is looking better already with supplies in the stores, you can only use forex to buy the goods you need and the pensioners don’t have access to this luxury. The plight of the pensioners will not change much. You see, they are at the bottom of the scale when it comes to government aid. Those who can 'add value to the economy' will be the first to benefit. They are the ones who will be employed in the reconstruction work force. The pensioner, as in South Africa, is not considered at all. Our pensioners in SA were given a R40:00 increase to their pensions this year. Big deal when a loaf of bread is between R6:50 and R10:00 each. Our Zim pensioners will be around for many, many years and we, together with you, our faithful suppliers will see to it that they, the pioneers and legacy leavers will not be forgotten or go hungry. Even though supplies are on the shelves in the shops, the prices will take a long time to normalize. A 250g tin of coffee selling for R15.99 here costs R65.00 in Zim and cooking oil 750ml here R10.89 is R45.00 while a 1kg box of oats costing R13.89 there will set you back more than R60.00 12,5kg maize meal is only R110.00 in Zim. I cannot even tell you the Z$ to ZAR exchange rate, just read the last paragraph and weep. Those between the ages of 50 and 65 are not employable and will stay with us until they reach their sell by date and many of them are not in homes yet. Those older and currently in the homes are the more fortunate as they have access to the support of the fund right now. Remember folk, you are always welcome to come on a trip with us. We need the help and you need the exposure and experience. With the water in Zim that’s not fit for human consumption, everyone boils their water and some are lucky to attain the correct chlorine tablets to make the water drinkable. We want to thank Maria Barkley of Oasis Water Tzaneen, for always donating enough drinking water for us on all of our trips. We appreciate it much and God bless you.